The staff of Grindstaff Kia invites local drivers from Elizabethton, Bristol, Johnson City, Tennessee and beyond to explore our full-service Kia dealership, online or on-location. As Johnson City's new Kia dealership, we offer the complete new Kia vehicle lineup and quality late-model used cars at affordable prices, plus auto financing, genuine Kia parts and professional auto service at competitive rates. Our dealership group, Grindstaff Automotive Group, has been serving the Tri-Cities of East Tennessee for thirty years with one guiding principle: "take care of your customers and they will be customers for life." We are proud members of the Elizabethton and Johnson City, TN communities, having supported the local East Tennessee Chapter of the American Cancer Society since 2007, along with other local initiatives. Local drivers can shop our new Kia inventory now, apply for auto financing, order genuine Kia parts and much more from here on our website, or visit us today to have the full Grindstaff Kia experience! Whether you are shopping for a new Kia Sorento, Sportage, Optima or a used car, applying for financing or bringing your vehicle in for service, you will find that Grindstaff Kia is a top-notch dealership that puts customers first. Our Finance Department is staffed by caring finance specialists who work tireless to help find auto loan options for drivers of all credit levels -- including those with bad credit. Kia factory master trained technicians at our Service Department perform any necessary maintenance or repairs on Kia and other makes promptly, including services such as oil changes, new tire installation, brake jobs, wheel alignments and more. DIY types can find the authentic Kia parts and accessories they need for their latest auto project by contact our Parts Department. 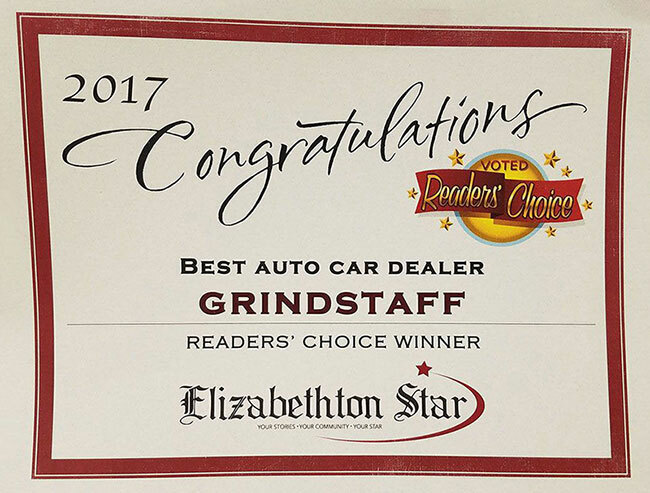 Grindstaff Kia should be your first choice for Kia and automotive services around Elizabethton, Bristol and Johnson City! Visit us today at 3608 Bristol Highway, in Johnson City, TN.